Devil's own. Dean Corso (Depp) has a near-death experience in Spain ... but is watched over by a mysterious angel/demon (Seigner). 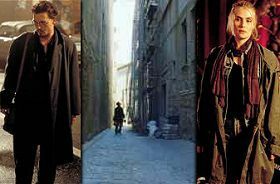 Review by Rich Cline Polanski returns to satanic thriller territory (Rosemary's Baby) with The Ninth Gate, based on a Spanish novel about unleashing the devil on earth, which seems rather pointless since, biblically, he lives here anyway. But never mind, this is an intriguing suspense film, very well crafted by Polanski to maximise the creep-out factor, even if the finale isn't nearly as good as it should have been. Dean Corso (Depp) is an antique book dealer in New York who's much more interested in the money than the books themselves. Until, that is, a serious collector (Langella) hires him to verify the authenticity of a copy of The Nine Gates, a 17th century volume supposedly cowritten with Lucifer himself and containing the secret to unlocking the nine gates of hell. It's up to Corso to travel to Europe to find the other two remaining copies of the book and solve the book's riddle. As he encounters other collectors who have more than a passing interest in this book (Olin, Jefford, Taylor and Rodero, as a pair of twitchy Spanish twins), Corso is followed by a mystery woman (Seigner) who could be either an angel or a demon. The film is so effectively creepy and intriguing that it draws you into its story, creating some very solid tension without taking itself too seriously. Depp is superb as ever; the supporting cast are very good at creating real people with underlying motives that even they might not understand. And Polanski surprises us with clever directoral touches that add humour and horror in equal measure. In fact, it's so fascinating and entertaining on every level that the culmination is even more of a blow to the system. It's not a bad ending per se, it's just not particularly well-handled, leaving us feeling deflated, perplexed and unsatisfied. Especially after all the sharp, top-quality stuff that went before.